Although the technology has existed for decades, on-going developments being made in 3D printing continue to increase the accessibility and affordability for everyday businesses and consumers. The applications for 3D printing infinite and may only be limited by our imaginations. Recent developments in modeling suggest far-reaching implications for the technology. No longer restricted to computer modeling, 3D printers may also be fed an image from a portable 3D scanner. A portable scanner allows for printing of items that are unique and may not benefit from mass production. 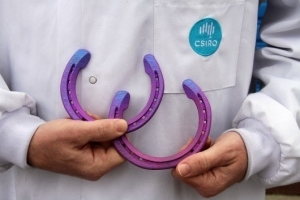 Some intrepid labs are even using the technology to print titanium horseshoes. While most horses benefit from wearing horseshoes, race horses in particular depend on shoes for traction and to reduce stress on the hoof and leg. Lightweight aluminum shoes have been the standard in horse racing. Titanium on the other hand, while better quality–lighter and stronger than aluminum–has not been the standard due to the higher cost associated with it. Thanks to 3D printing, however this is changing. Instead of aluminum, titanium powder, which can be used in 3D printers, is the stronger, more affordable alternative. Regardless of the material or style, horseshoes must be the correct size and are shaped to fit each horse’s hooves. Farriers often make adjustments with a hammer and anvil, or, if they have time and access, will shape the shoe in a forge. Though time consuming, either process is necessary to ensure that the shoes are a good fit for the horse. When horses are improperly shod as a result of poor technique or an ill-fitting shoe, serious health problems can occur. Just as correct footwear and arch support can improve posture in a human, a good shoe is the foundation of a sound horse. A shoe that does not fit can cause skeletal misalignment, leading to increased risk of injury or long-term health problems. Printed horseshoes are being tested with success in Australia, but considering the increasing presence of 3D printers and the popularity of horse racing and other competitive horse disciplines around the world, it could be a matter of time before more horses enjoy custom designed, 3D printed shoes.